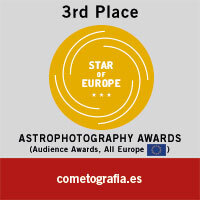 El cometa 45P/Honda-Mrkos-Pajdusakova fotografiado el 23 de Diciembre de 2016 en su camino hacia el perihelio, pocos días después de que empezase a desarrollar una larga cola iónica de varios grados de longitud y que en esta imagen se sale del campo en dirección Este. 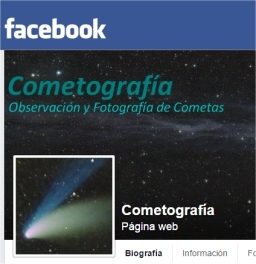 Aunque el cometa se encontraba a sólo 8 grados de altura sobre el horizonte dificultando su fotografía, puede apreciarse que realmente se trata de una doble cola partiendo desde la coma verdosa del cometa, la cual brillaba con una magnitud aproximada de 8 siendo observable mediante prismáticos. 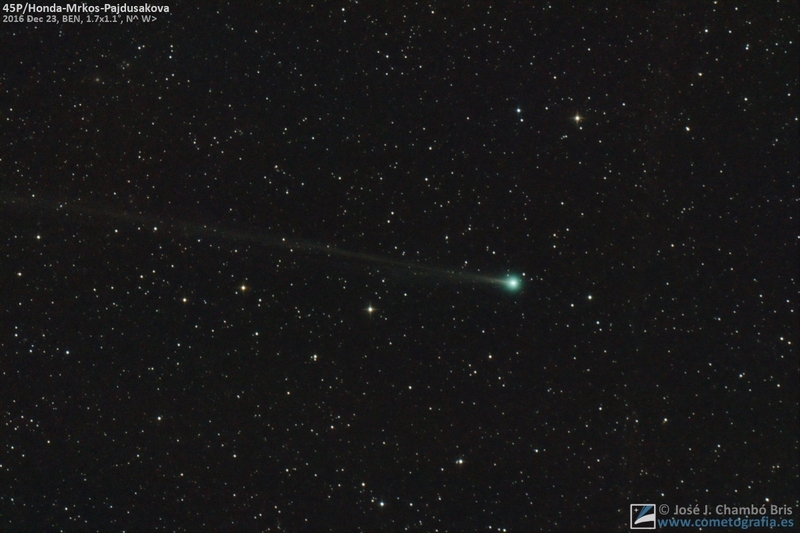 Comet 45P/Honda-Mrkos-Pajdusakova imaged on December 23, 2016 in your way toward perihelion, few days after begining to develop a long ionic tail with several degrees long which exits from image field toward East. 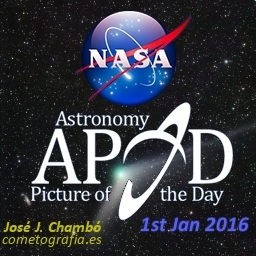 Although the comet is only at 8 degrees of altitude from horizon, doing hard the photography, can be seen that really is a twin tail departing from the greenish coma of comet, which shining near magnitude 8 being observable with binoculars. 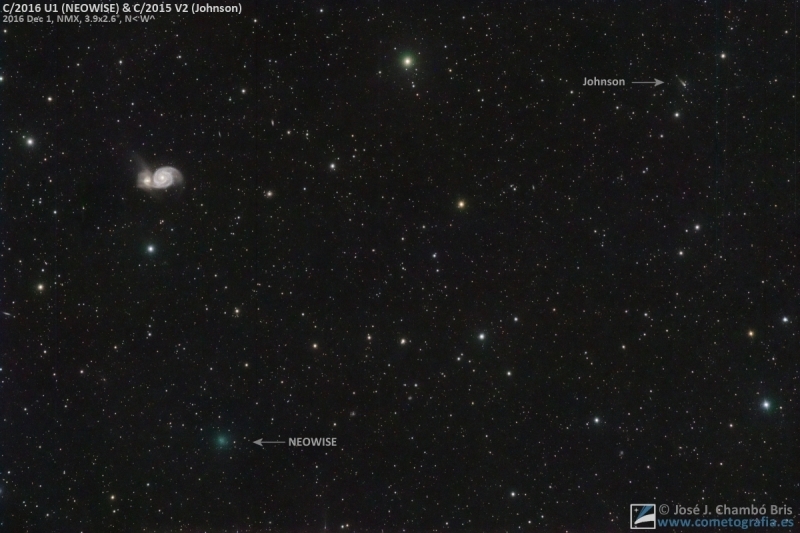 Two new comets in approach to Sun casually concur into same field near Whirlpool Galaxy (M 51) in this image taken on December 1st, 2016. 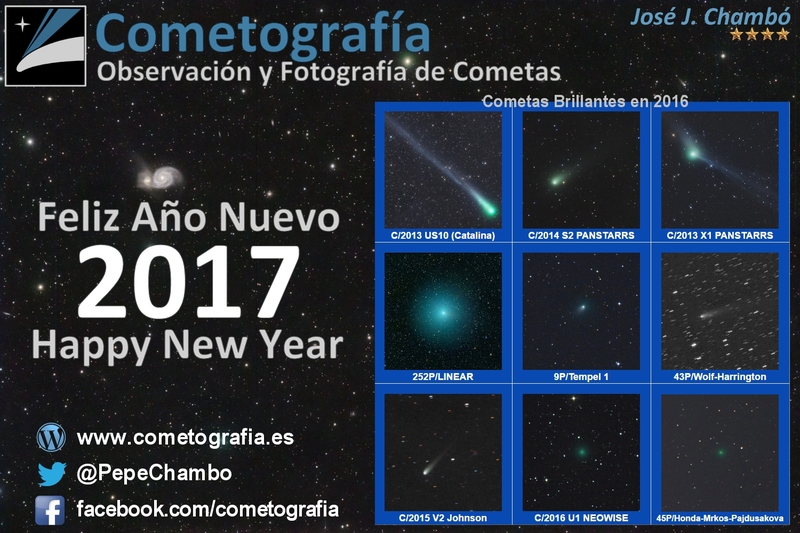 At the left bottom, the recently discovered C/2016 U1 (NEOWISE) shows a fuzzy and green coma due to its composing of ionized carbonic gas, while at upper right is the comet C/2015 V2 (Johnson) with very different morphology, more dusty that gassy, shows a small and whitis coma from which departs a short tail of dust. Both comets could be observed using binoculars in the future: NEOWISE at the end of this month of December before immerse into light of dawn, of which perhaps will not come out because is possible the comet to disintegrate at approach to Sun; comet Johnson will reach its maximum brightness on next spring 2017.